For a conflict long teetering on the edge of conflagration, the newfound sense of positive expectation in Karabakh is striking. Understandably so, perhaps, following an informal meeting between Pashinian and President of Azerbaijan Ilham Aliyev in late September 2018 on the margins of the Commonwealth of Independent States (CIS) summit in Dushanbe. The brief encounter between the two leaders produced an unexpected agreement to reduce tensions and establish direct lines of communications—a rare example of seemingly tangible progress in the seemingly intractable conflict. These informal negotiations were followed by two official meetings organized by the OSCE Minsk Group (MG) in December 2018 and January 2019, where the MG co-chairs appealed to both sides to take “concrete measures to prepare the populations for peace.” Pashinian and Aliyev had another unofficial conversation on the side-lines of the Davos World Economic Forum in January 2019 and discussed steps for advancement of peace talks. All these meetings were accompanied by a noticeable softening of official rhetoric from both sides. The number of casualties and cease-fire violations have also significantly decreased. In December, Aliyev replaced regular troops deployed on two segments of the border with Armenia with border guard personnel. 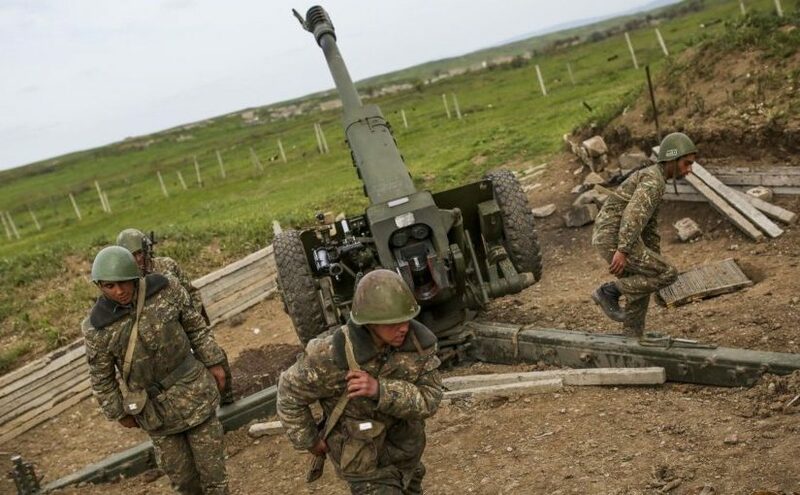 While the change is more symbolic than substantive, given that Azerbaijani border forces would be no less heavily armed or equipped compared to those from the regular army, the decision has been nonetheless interpreted by some analysts as a constructive step. Meanwhile, those displaced regular troops were simply redeployed to an area near the volatile Line of Contact. These developments were met with widespread approval by the international community. In January, UN Secretary-General spokesman Stephane Dujarric applauded the thaw between the long-time combatants. “The Secretary-General appreciates the continued commitment of the sides to finding a negotiated and peaceful solution to the long-standing Nagorno-Karabakh conflict and particularly welcomed the Ministers’ agreement on the need to take concrete measures to prepare the populations for peace.” The EU also welcomed the thaw in the peace process and expressed its full support for the mediation efforts of the OSCE Minsk Group co-chairs. However, there is a drastic mismatch between rising international expectations and the ground-level realities in and around the Karabakh conflict. Despite the interlude of good feelings, the positions and strategic interests of the parties to the conflict remain so far apart that the war continues to be the likeliest outcome. To wit, the most basic preconditions for a lasting settlement continue to be strategic nonstarters. The Madrid Principles, which in some form or another have been the basis of the negotiation process for the last decade, imply territorial concessions from the Armenian sides in exchange for the right to self-determination of Nagorno-Karabakh through a delayed, legally binding referendum. Other important components include an interim status for Karabakh before the final plebiscite, a land corridor between Karabakh and Armenia, the return of refugees, and the deployment of an international peacekeeping force in the conflict zone. Even amid a brief moment of optimism, it remains practically impossible to reach any such agreement along these lines in the near future. Azerbaijan has ruled out the possibility of accepting any legal status for Nagorno-Karabakh outside its jurisdiction. Baku has repeated stated that it would only accept Karabakh’s autonomy within Azerbaijan’s international border. However, this is considered unacceptable for the Armenian sides. For Armenia, Nagorno-Karabakh’s status outside Azerbaijan and its security are top priorities. Moreover, the political environment has evolved in recent years in a way that no Armenian leader has the capacity to sign a peace deal which includes territorial concessions to Azerbaijan—even if it were in exchange for Nagorno-Karabakh’s internationally recognized, independent status. Azerbaijan’s bellicose rhetoric and large armament purchases over the last decade have persuaded most Armenians that Azerbaijan is uninterested in peace and poses an existential, civilizational risk to Armenians. As a result, a consensus has emerged that considers both the territory of the former Nagorno-Karabakh Autonomous Oblast as well as the territories taken by Armenian forces to be essentially inseparable and mutually critical for Armenia’s strategic depth. The temporary bonhomie aside, Armenian and Azerbaijani leaders perfectly understand these limitations and are pursuing their own specific agendas. President Aliyev imitates a constructive stance so to cast the inevitable failure of the peace process on Armenia and prepare for a new offensive in Karabakh. Meanwhile, Pashinian is also playing the imitation game and trying to win time for the rearmament and modernization of the Armenian armed forces. When it comes down to it, prospects for lasting peace deal were far brighter in late 1990s and early 2000s when the level of hostility was much lower and the conflicting armies were not so heavily armed. The imitation game that masks the region’s strategic realities lead to the unavoidable conclusion that renewed conflict, and not peace, is the most likely outcome. In some sense, the false sensation of forward progress engendered by the peace talks may only contribute to a more rapid destabilization in the future. High level talks make for good headlines, but do little to change strategic conditions until certain mechanisms are established to institutionalize the peace process. The cease-fire regime should not depend on the whims or goodwill of the parties to the conflict. In an environment where war still continues to be a popular option and is used as part of a blackmail tactics, compromise and real peace still seems like a long shot. Tigran Grigorian is an EDSN fellow and a political analyst from Nagorno-Karabakh, where he is a founder and leader of the opposition National Revival Party. EDSN is an international research fellowship project of the Center of Social Sciences, Tbilisi, and made possible with the support of the National Endowment for Democracy. This article was first published by BNE Intellnews as part of a content-sharing agreement.